Sometimes when users remove programs via Control Panel, not all components disappear completely. For example, ShopperPro64.dll belongs to ShopperPro adware application, and sometimes when users delete ShopperPro from their PCs, some old registry entries remain, and users receive ShopperPro64.dll runtime error pop-up. It just means that you have not terminated the adware properly. In other words, the program is gone, but there are some traces of it left and they cause the ShopperPro64.dll error to show up. To remove ShopperPro64.dll, you need to scan your PC with a powerful antimalware tool and delete unwanted components automatically. There might be several error messages related to ShopperPro64.dll that appear on your screen. For example, “ShopperPro64.dll runtime error”, “ShopperPro64.dll windows error”, or “This process has failed to start because the ShopperPro64.dll configuration is incorrect”. The reason why Windows is trying to load ShopperPro64.dll is that when ShopperPro is installed on your computer, the application is configured to run automatically each time you turn on your computer. However, when you delete ShopperPro, some of the configurations remain, and the system still tries to load the program even though it no longer exists. That is why you see the ShopperPro64.dll error on your screen. Needless to say, that the error would not appear if you did not remove ShopperPro from your computer, but it is a bad idea to keep an adware application on the system. ShopperPro is published by Goobzo LTD and this application intends to generate financial revenue for its creators by redirecting you to affiliated commercial websites or online marketing surveys. This program does not want to infect you with malware, but it is important to keep in mind that malevolent third parties often exploit adware applications to promote their corrupted content. Therefore, if you want to avoid various security issues, you need to terminate ShopperPro right now. You can find manual removal instructions for ShopperPro below this description, but there is also a possibility that ShopperPro64.dll error will appear on your computer. In such a case, you are strongly recommended to invest in a licensed computer security application, because it is not a good idea to work with Windows Registry editor if you are not an experienced computer user. You can also scan the PC with SpyHunter free scanner, because this way you can also determine what potentially unwanted files or programs are left. 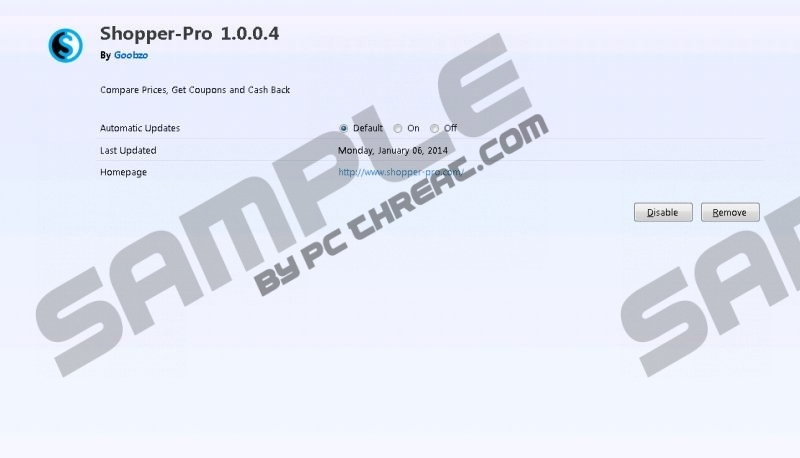 Since ShopperPro often arrive bundled with freeware, you may have other adware applications installed on the PC. Nevertheless, resorting to using legitimate computer security software would be your best bet, because this way you would ensure that dangerous threats do not enter your PC. Open Uninstall a program and remove Shopper-Pro. Select Add or remove programs and uninstall Shopper-Pro. Select Extensions and remove ShopperPro from the list. Quick & tested solution for ShopperPro64.dll removal.